Social media being what it is — a lot of the restaurants I end up visiting are because some friend out there posted something wonderful to their profile. 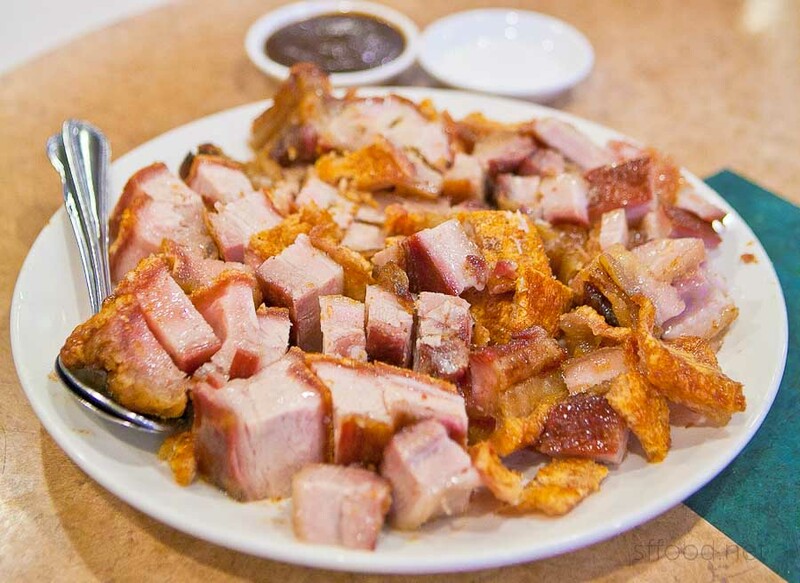 In this case, Riverside Seafood Restaurant came onto my radar because fellow food aficionado and comrade Sir Albert Cheng posted one exquisite, drool-inducing shot of pork belly and it popped up on my feed. Upon seeing it, I vowed to visit to try that dish. Almost a year later, I finally got around to organizing a dinner at Riverside Seafood Restaurant. The thing about reviewing a Chinese restaurant is that there needs to be more than a handful of us for me to taste a decent amount of food. 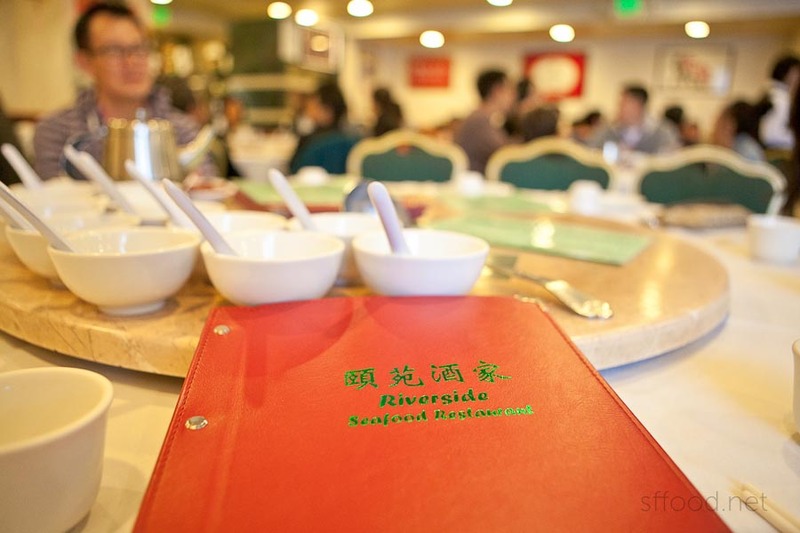 Even the most average Chinese restaurant menu has more items than I can taste in a few visits — so when at all possible, as I did with House of Chen, R&G Lounge or Great China Restaurant, I needed a lot of friends to get together for dinner. Strangely enough, on this one Saturday — everybody I texted in the afternoon for dinner on the same night was available. Hence, a group of 11 of us headed Riverside Seafood Restaurants. It’s a good thing I called to make reservations, because when we arrived at 7pm, every table but mine was taken. 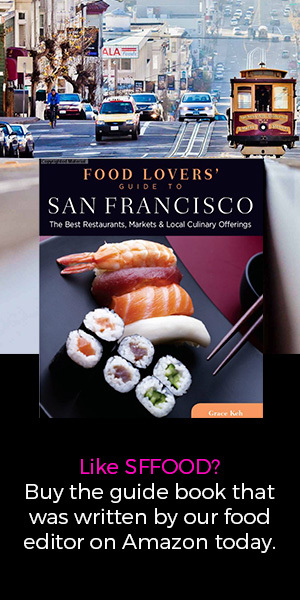 Riverside Seafood Restaurant is located in the Sunset District of San Francisco — an area I rarely visit. In a city that is only seven miles wide, it’s hard to say something is really “out there” but any locals would attest — the Sunset is really out there. It’s a different region entirely in terms of weather and feel, and in a city where there is no freeway access across the city — it’s seven miles of local streets with impressive traffic, not to mention city buses, cyclists, pedestrians and even skateboarders impeding your speed. It’s actually taken me over an hour to get across the seven miles, believe it or not! The menu is vast as expected, but Riverside Seafood has set menus for large parties of 10 or more at varied prices from $238 to $388. 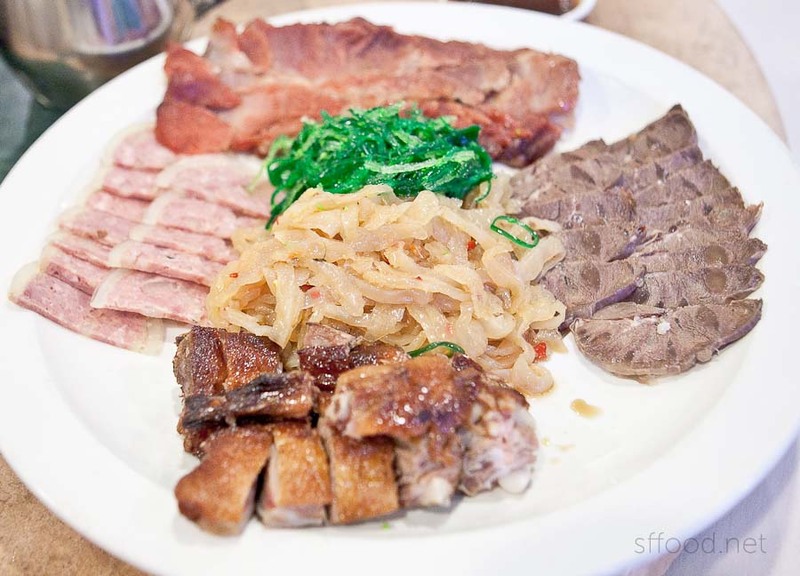 Each set menu offers some similar items but as you get progressively more expensive, the higher-priced dishes begin to emerge. On this night, I opted for the $298 meal, with two extra order of the pork belly added. While we had eleven people — we could always order more if needed. The restaurant posed no objection to this. First up was the glorious pork belly. I was advised by my friend to call ahead to make sure they have this prepared–but given that it was an impromptu reservation, I forgot to ask. Originally, I was told that they may have run out (at which point I visibly deflated), but our server checked with the kitchen and apparently, what they had left emerged. Pork belly! This is why I came! The Korean in me didn’t realize these would be served room temperature, if not slightly chilled. Every Chinese friend at the table confirmed that this is the way it was supposed to be, but suddenly, I craved a Korean barbecue grill. They were cooked so beautifully with soft and velvety insides and an impressive outer crunch of the skin — and all I needed was a heat source, some kimchi and a bowl of rice to perfect it. 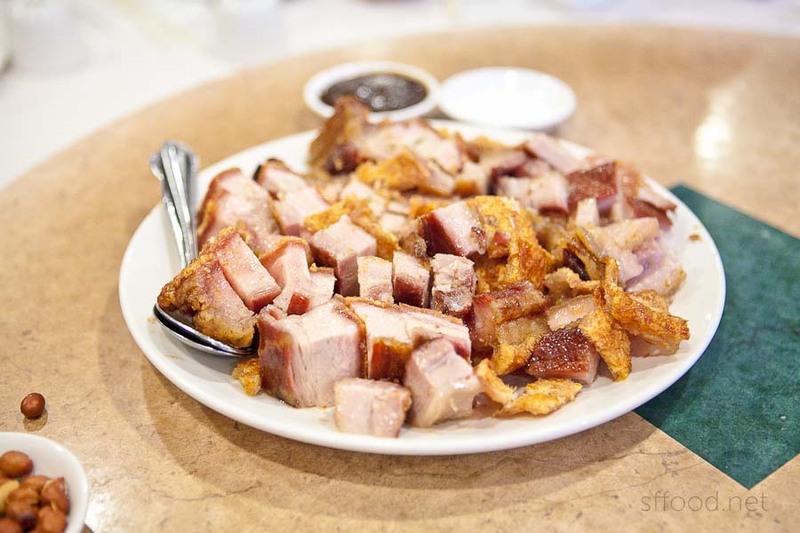 The pork belly at Riverside Seafood Restaurant is also nicely seasoned — especially if I had some rice! Keep in mind that while I won’t ding a pork belly for being too fatty, this particular one was extremely fatty. You’ve been warned! Thankfully, as I had requested, the fried rice emerged quite early. I don’t know about you but I need rice for nearly every course except soup. 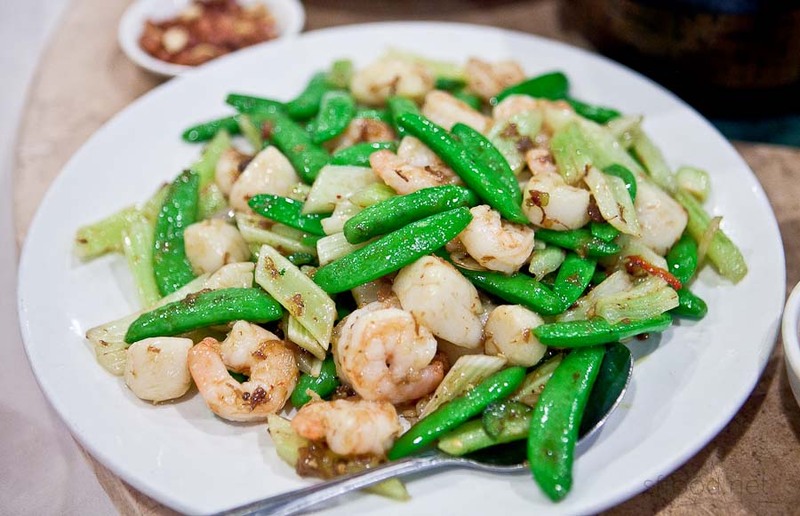 Overall, Chinese food is seasoned in such a way that a starch source is necessary to balance it out. 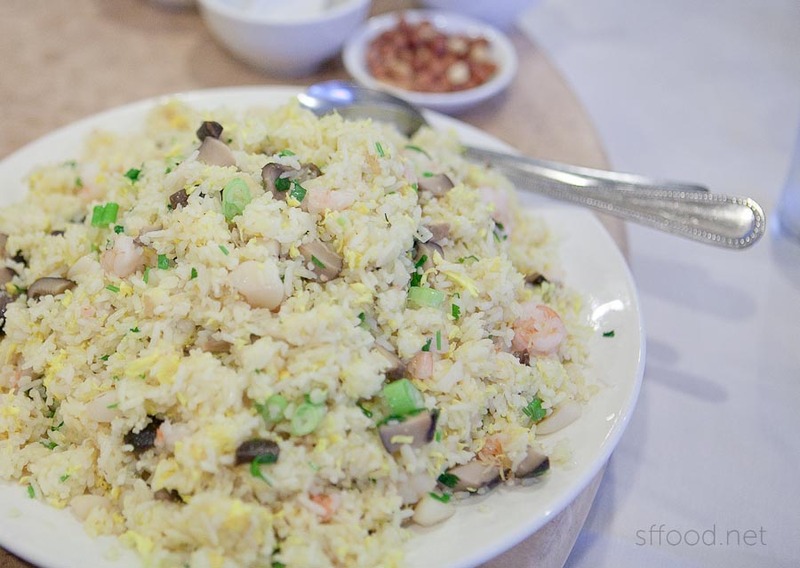 Riverside Seafood Restaurant has a really good fried rice. The portion of fried rice that was given to us was HUGE. I believe even though we all had rice with each course, there was still some leftover. It was also perfectly fried with flavors alive throughout. 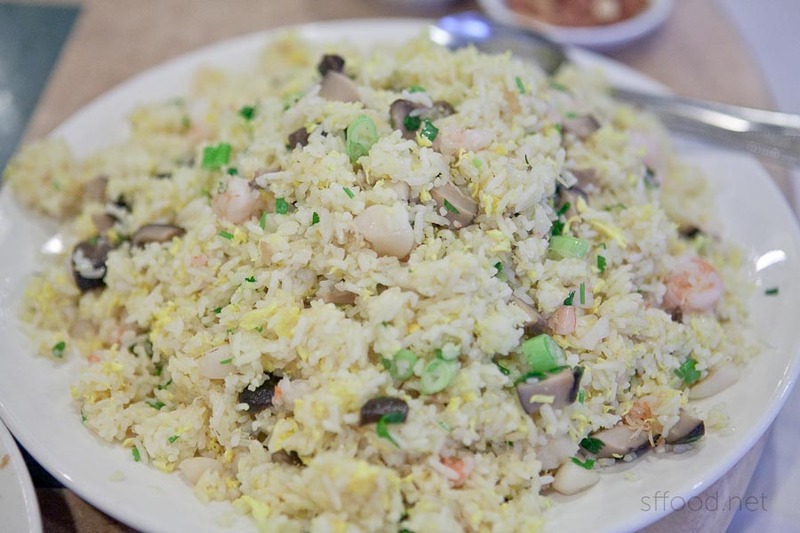 Nice piece of seafood were generously put into the fried rice. The second course of the set menu was the assorted appetizer platter — which would have been first if I had not requested the fried rice. 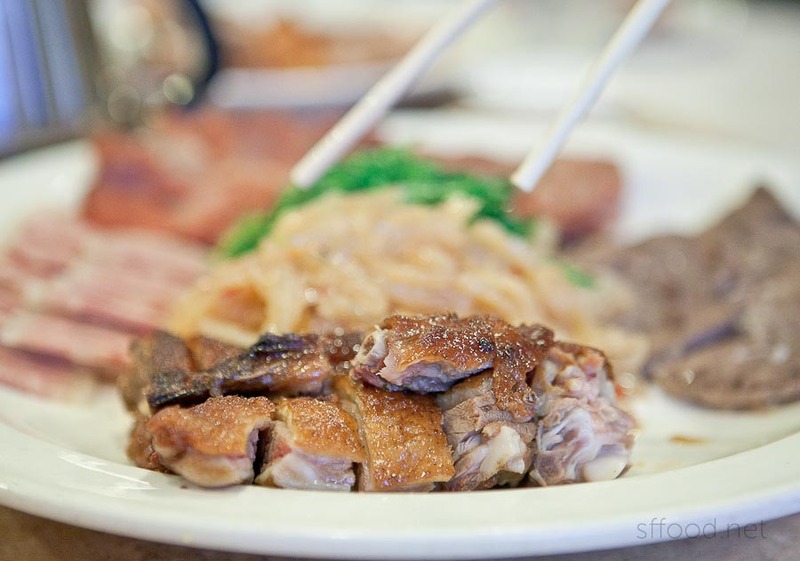 While the roasted duck was delicious, the rest was pretty much on par with any other restaurant. There wasn’t anything remarkable about the portion, taste or presentation — though it makes for a light start to the meal. 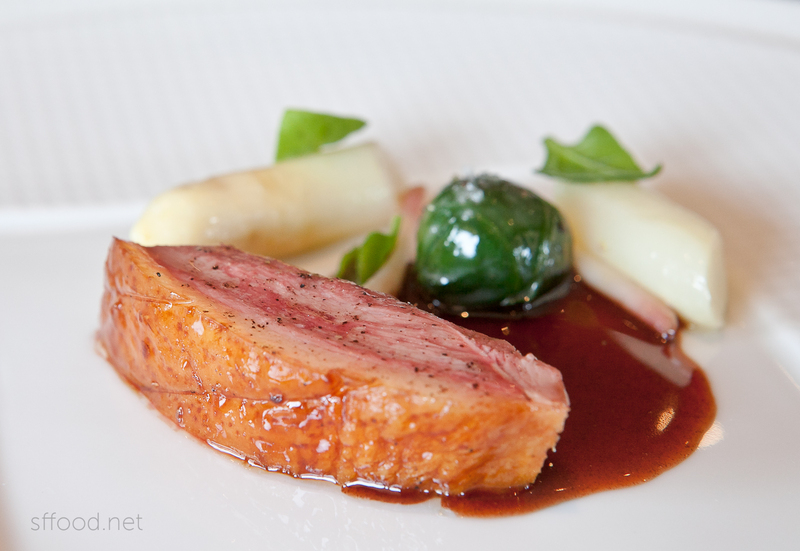 The duck was moist and fatty — a combination I like very much. It was nicely roasted and the meat was tender with a little crisp to the skin. 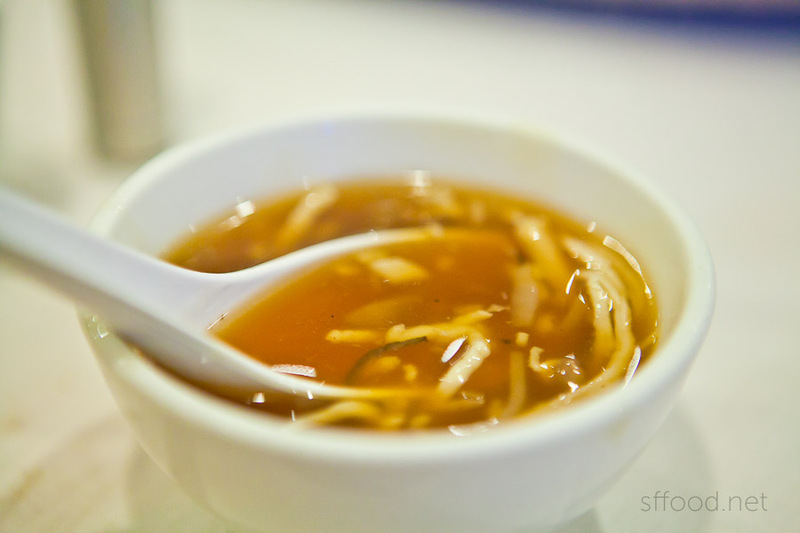 Then came the soup as the third course at Riverside Seafood Restaurant–called House Special Combination Soup. The bowls had been on the table from the start, but our server delivered the soup and divided into all the bowls in one fell swoop that I missed the whole bowl shot. It was only when the soup was handed to me that I realized it had arrived. So, there’s my single bowl of soup! The House Special Combination soup was tasty. 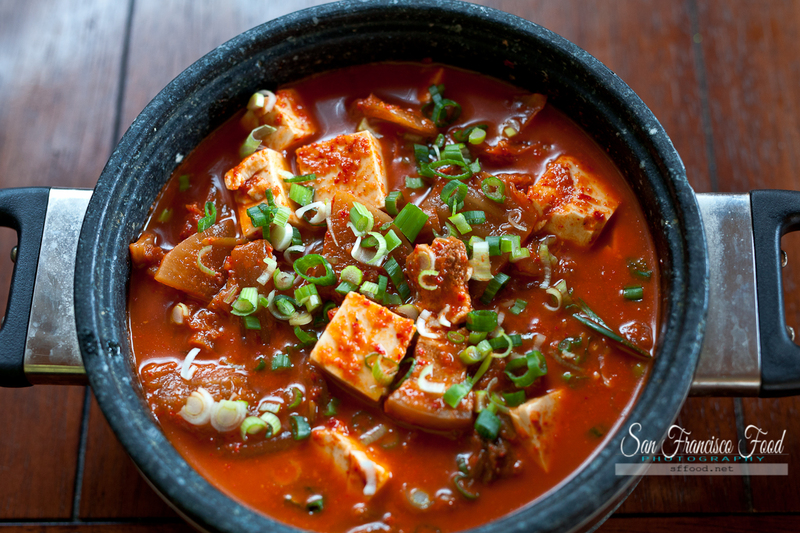 It was reminiscent of hot and sour soup in color and texturally, but had a deeper flavor without the intense sour or hot notes. With a little bit of the hot sauce that Riverside Seafood Restaurant makes onsite — it was delicious! Next up was the fourth course: Crispy Roasted Squab. Now, let’s diverge to how I actually feel about pigeons for a second. I am not a bird person — and while I am happy to gaze at an eagle so long as it’s at a far enough distance from me – I am just into anything that flaps around me or flies. Let’s put it this way – there’s a greater chance that I will hug a lion than there is that I will grab a bird by the hands…or even a net. I don’t like birds. Sure, I like chicken and duck as much as anyone but I’m not the one out there capturing them. And pigeons… don’t even get me started on how much I detest pigeons. 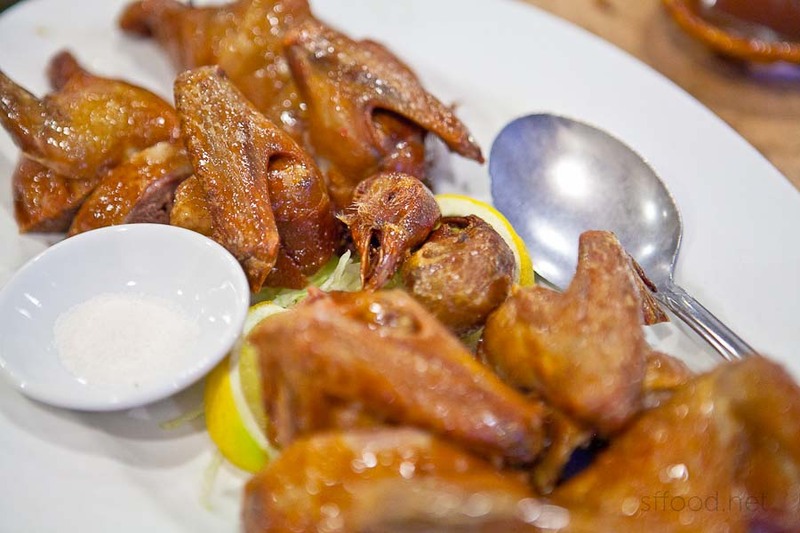 It’s no wonder then that the one meat that I don’t like, regardless of taste, is squab. Especially when they’re staring at you. But for the sake of this review — I did taste it, and it was good. Wonderfully crunchy on the outside with really quite fatty meat on the inside, the flavor was perhaps better than regular ol’ chicken, but one was enough. A pigeon is a pigeon is a pigeon. Vile creatures. The prawn and scallops with X.0. dish was simply awesome. 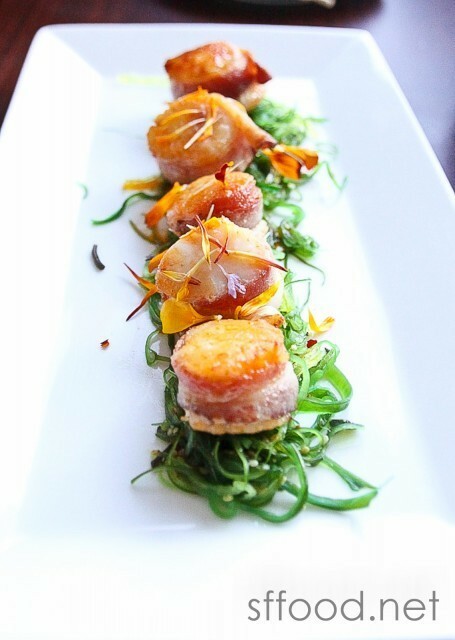 The seasoning was spot on, and it was cooked to bring out all the sweetness of the ingredients, especially the scallops, which were moist and plump but not rubbery at all. This was the fifth course in the banquet menu. Chef’s Special Chicken — yum!! 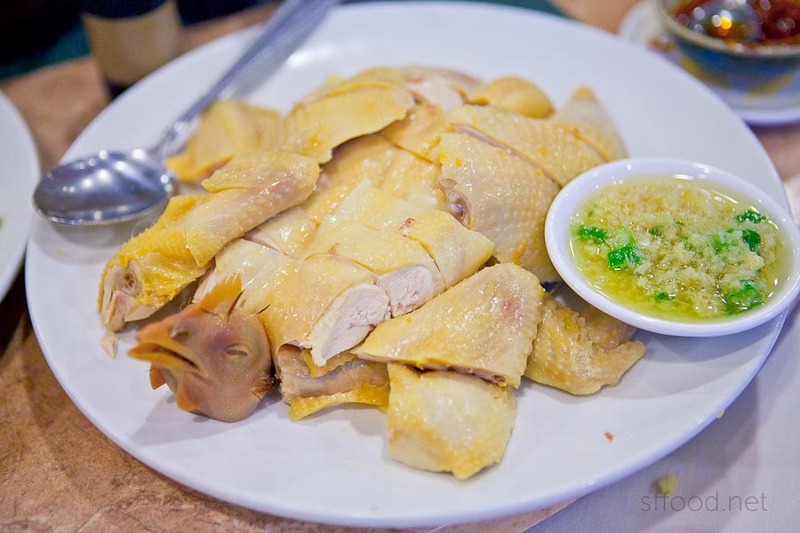 As someone who loves a nicely steamed chicken or even boiled chicken, I’m always excited for this dish at Chinese restaurants. The chef’s chicken at Riverside Seafood Garden. presented as the seventh course, is very good, with an excellent oil dip that offers a substantial ginger punch. The head of the chicken — also unnecessary, haha – but this is one solid dish. The next dish was one of my favorites of the evening. 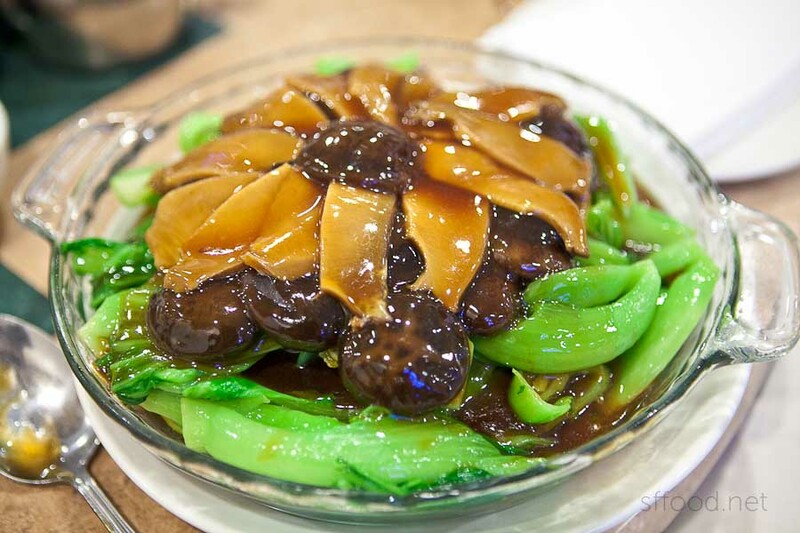 Perhaps it was because we were approaching a ridiculously full level, not everyone seemed to like this dish as much as me — but tender slices of abalone adorned a pile of vegetables. 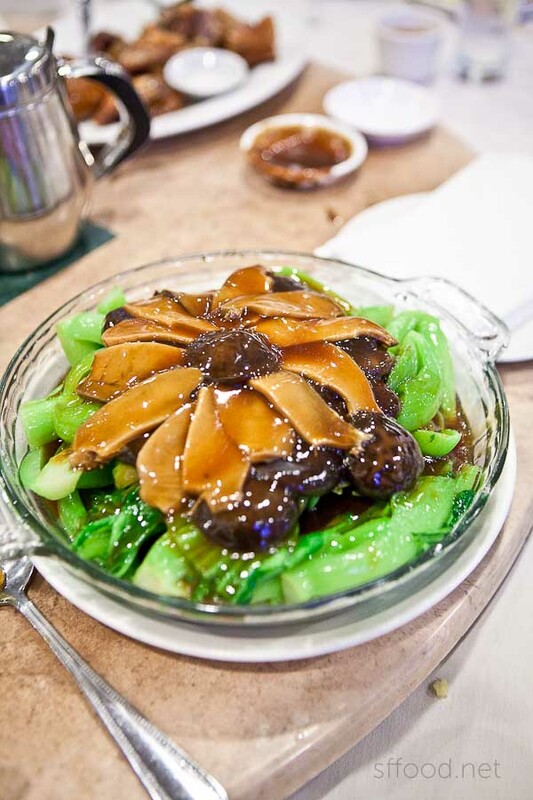 The black mushrooms were sensational — cooked perfectly to maintain a nice bite but tender. The greens were also perfectly done. Combined with the sauce, this dish was a star, in my mind. As the ninth course (yes, ninth! ), we were presented with a baked lobster. It appeared to be about three lobster broken down into chunks, baked and covered in a light seasoning sauce. The lobster meat was well-done, and held its own against the light sauce nicely. 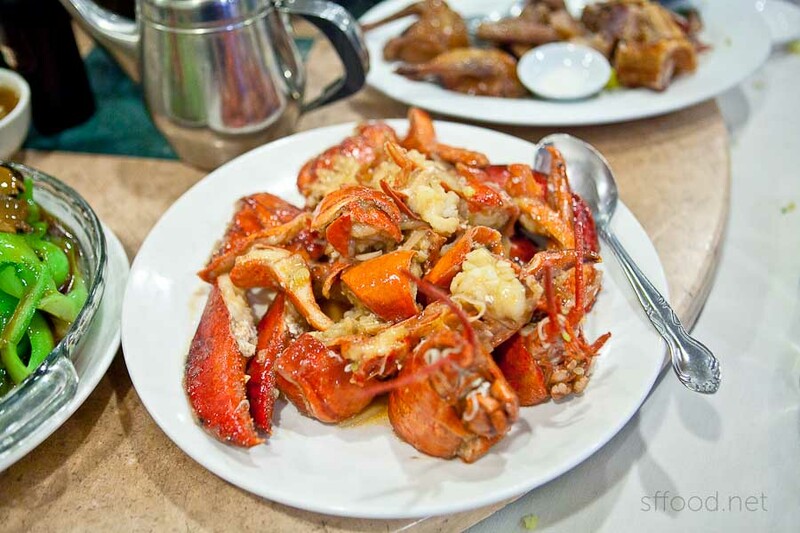 This particular lobster can rival the more popular crab at places like PPQ. What’s a Chinese restaurant meal without the whole steamed fish at the end? Riverside Seafood Restaurant has their own tanks toward the back of the restaurant with a variety of fish swimming about. 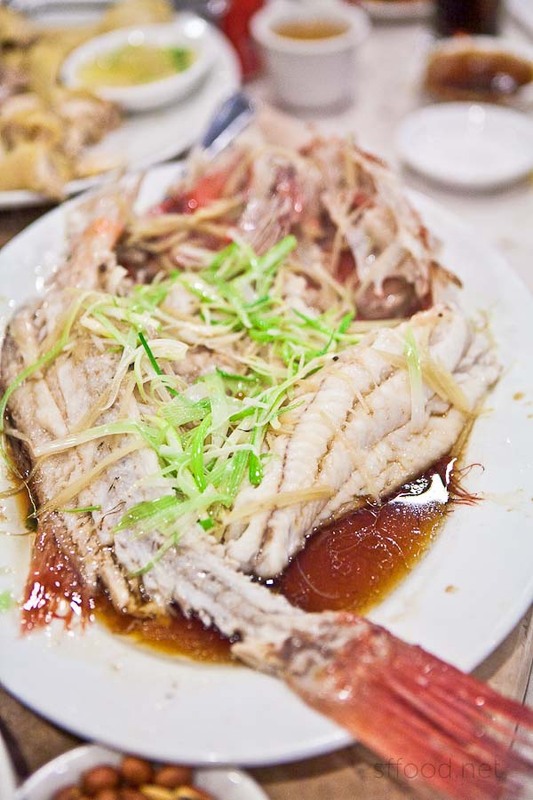 In the family-style banquet menu, one of the fish is selected to be steamed whole, and presented “open” as shown above. With a simple soy and sesame sauce, this particular fish presentation is light but full of flavor. Just when you think you can’t eat enough — you find that you can always have another bite of this fish. This was the tenth course, but we weren’t close to done. Anyone who follows this blog knows I’m just not that big on dessert. So when it came out, combined with my full tummy and food coma setting in, I barely paid attention and just got one shot of what was laid on the table. 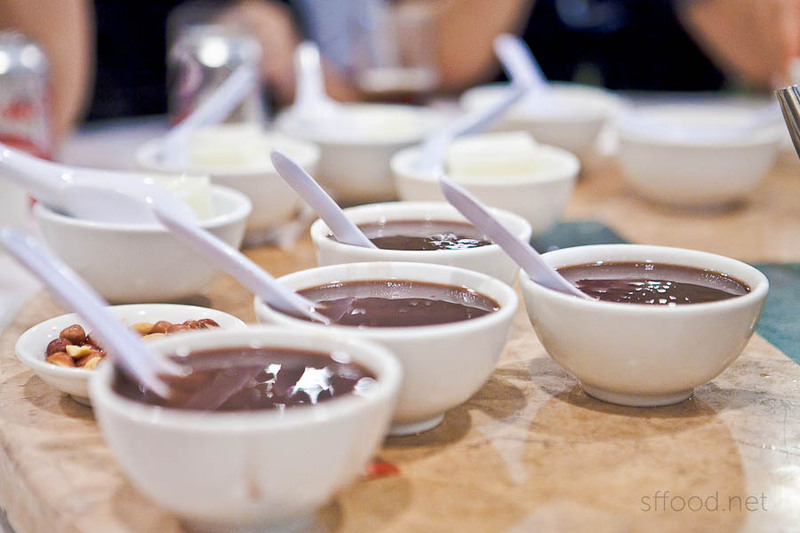 The staff at Riverside Seafood Restaurant brought out three different types of desserts in bowls: almond pudding, mango pudding and red bean soup/porridge type of dish. The latter being popular as Korean food, too, I took one of those for myself. 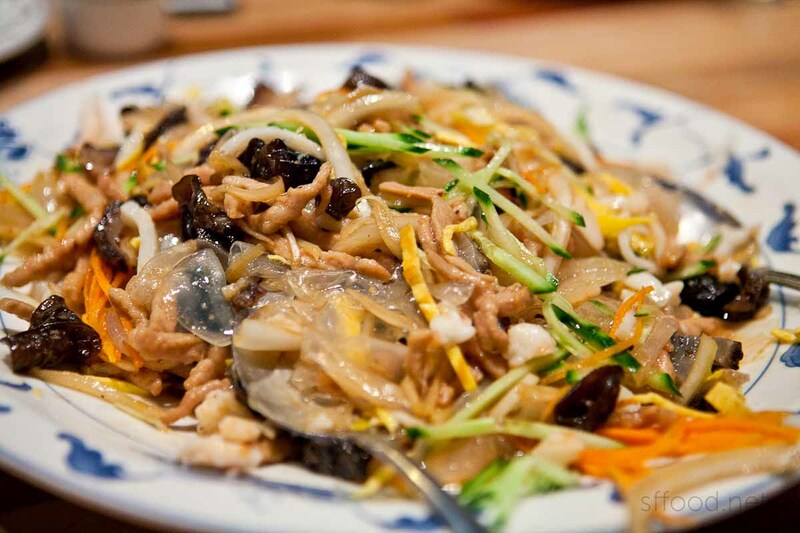 Much like Korean pat-jook, this was similar in taste without any rice, and no rice cakes. Taste-wise, it was solid, but as mentioned, I was too full. A friend next to me was having the mango pudding, and one bite into it, I called our server over and did what I normally never do: I asked for more of the mango pudding. It was SO good! The great pudding texture and creaminess combined with strong mango flavors in each bite made plain old mango look weak. One taste of it and I was brought back to life! 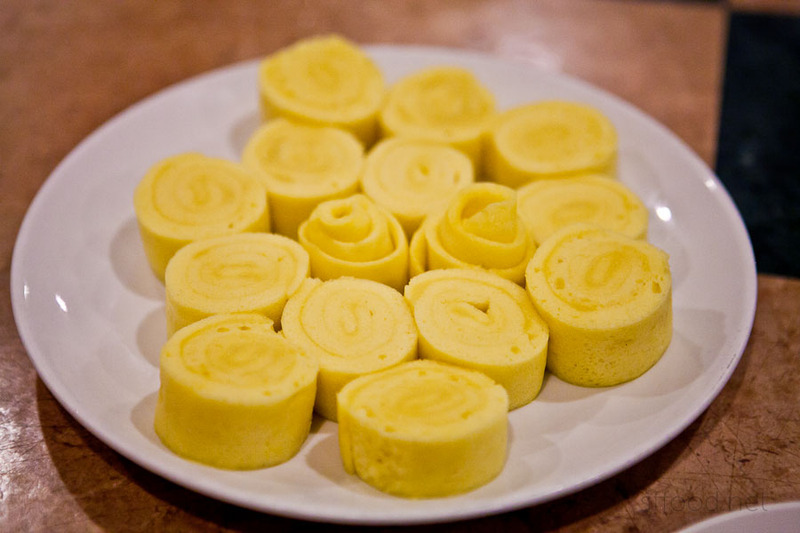 Unbelievably enough, another dish was brought out as a dessert — freshly-steamed egg rolls. I believe that I’ve had this in my childhood as the flavors and texture are oddly familiar to me, but I can’t recall where. In the U.S., this was the first time I’ve had this dish, but let me tell you how good this is. Unbeknownst to me was that Riverside Seafood Restaurant is primarily known as a dimsum restaurant. Only the neighborhood residents and those in the know go here for dinner, I’m told. Even so, it was a full house on a Saturday and stayed packed through our enormous dinner. I want to mention the service at this restaurant. From my phone reservation to the very end of the meal, I thought the service was excellent. 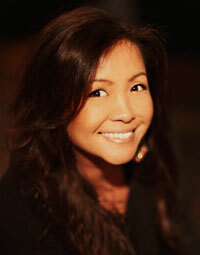 Every single server we encountered through to the manager who presented our last dish was courteous and friendly. We had a lot of requests this evening for this or that simply due to the size of our party, and never did I even notice one bit of annoyance from them. Ordinarily, this is no less than what’s expected. But if you’ve gone to enough Asian restaurants, you know this exceeds the norm by a landslide. That said, a few of my friends at the table said that at about course two, they felt that the staff knew I was there to review the restaurant. 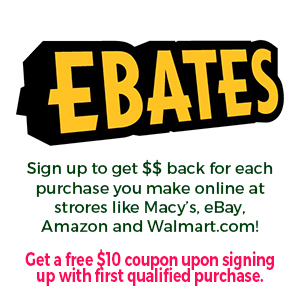 This may or may not be the case as I couldn’t tell — but I mention it because your mileage may vary. 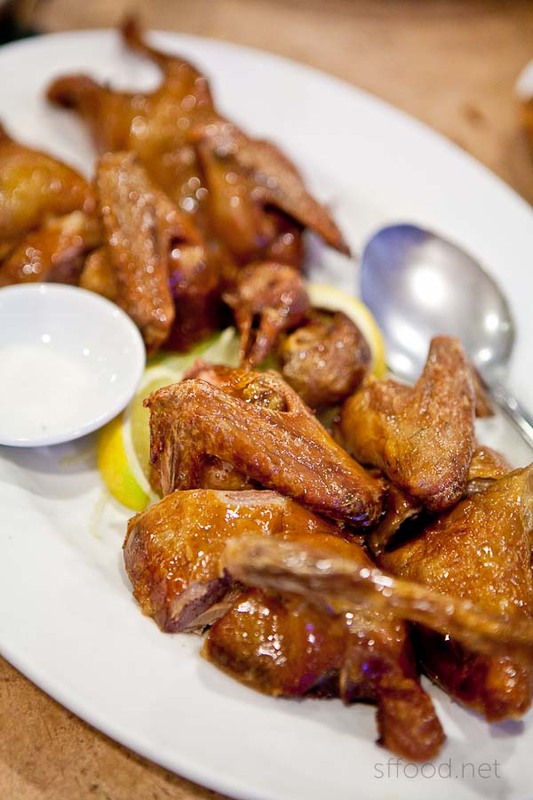 Overall, Riverside Seafood Restaurant offers fresh and vibrant cooking that pleases the palate. 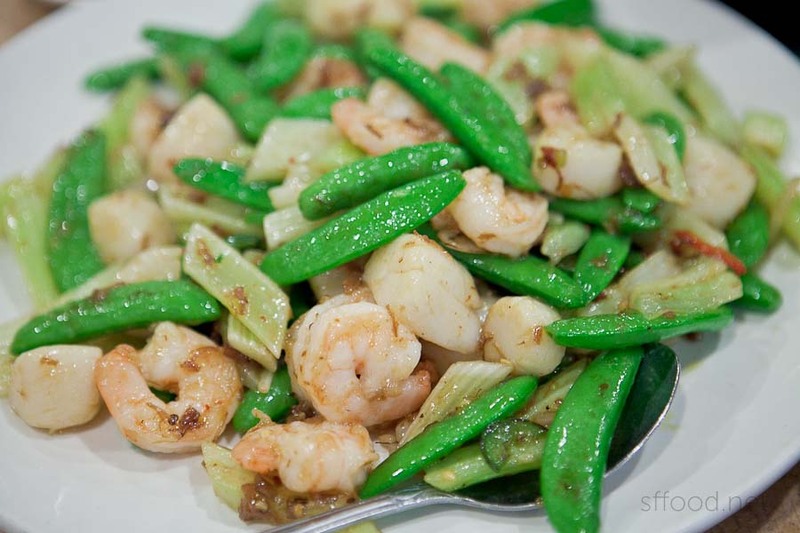 It meets or exceeds everything you expect from Chinese food. They’re able to accommodate large parties like ours (though 12 was the max for our table — though I’m sure they’d put in the effort to accommodate larger parties). I definitely recommend reservations for weekend evenings, and the line they have for dimsum is well documented in other reviews. 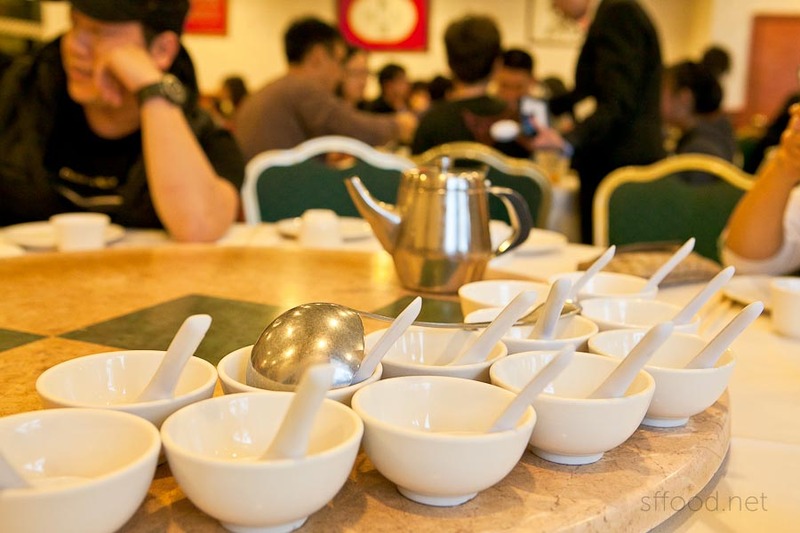 I have so many favorite dimsum restaurants that I am not sure when I’ll head to the Sunset area to try the dimsum here, but if ever I had the opportunity to do so, based on our dinner here, I would not hesitate for an instant. Do not skip dessert at Riverside Seafood Restaurant!